The U.S. Coast Guard Sector Columbia River was contacted on Monday morning after a worker was injured while installing a recirculation system aboard the bulk carrier Ergina Luck. The worker fell into the bilge, and it was reported that both his legs and back were injured in the fall and that he was unable to walk. The Ergina Luck was anchored in Astoria at the time of the accident. The Clatsop County high-angle rescue team was transported from Station Cape Disappointment aboard a 47-foot Motor Life Boat to assist and transport the injured man. The rescue team immobilized the injured worker, then carried him up three sets of stairs before he could be lowered to the crew members aboard the MLB. He was then transported to emergency medical services at the 17th Street Pier in Astoria, Oregon. The injured man is employed by Degesch America at their Portland, Oregon location. The company specializes in fumigation, degassing, and abatement services for bulk carrier vessels. The incident is under investigation. 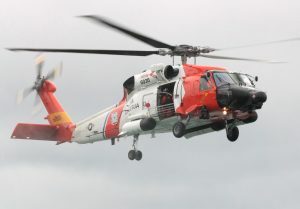 A 25-year-old man was airlifted by the U.S. Coast Guard from the 107-foot fishing vessel Bering Hunter after he fell and suffered a head injury. 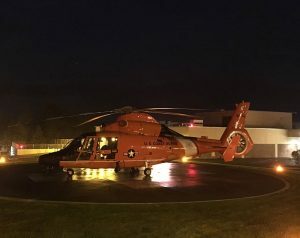 Watchstanders at the 17th Coast Guard District command center received a call from the captain of the vessel, stating that a crewmember had fallen and sustained a head injury. 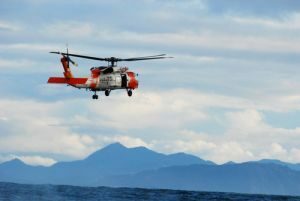 The Coast Guard duty flight surgeon recommended the medevac, and a Coast Guard Air Station Kodiak MH-60 Jayhawk helicopter crew was dispatched to the Bering Hunter location. 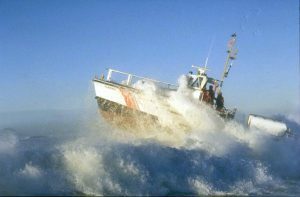 Five fishermen were rescued by the US Coast Guard after their vessel began taking on water west of Cape Alava, Washington. Watchstanders were alerted to the situation on Wednesday, January 31st at 1:15 p.m. The 87-foot F/V Sunnfjord was taking on water, however, dewatering pumps were unable to keep up with the rising water. Good Samaritan vessels Island Voyager and Equinox responded to the distress call in addition to Coast Guard cutters Cuttyhunk and Swordfish. An MH-65 Dolphin helicopter from Coast Guard Air Station/Sector Field Office Port Angeles, a Motor Life Boat from Station Quillayute River, and a Motor Life Boat from Station Neah Bay were also part of the response team. Watch the video of this heroic rescue. As the water rose in the engine room, fishermen donned survival suits and life jackets. The helicopter crew initially planned to pick up and deliverer another dewatering pump, but as the situation grew dire, they refueled at Neah Bay then traveled directly to the F/V Sunnfjord. 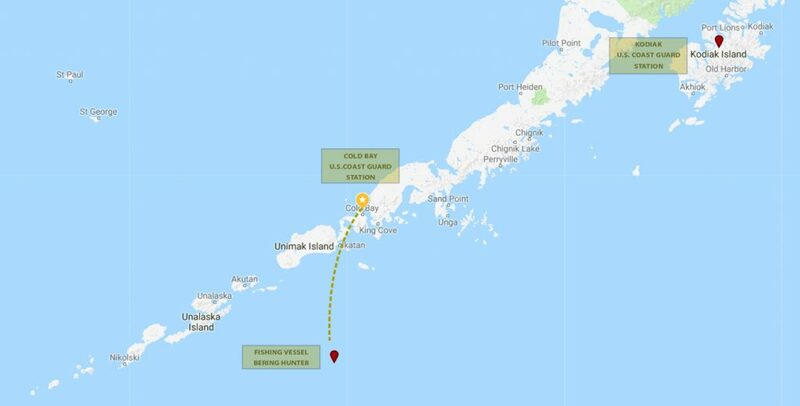 January 6 was a tough day for the F/V GUDNY and Coast Guard Cutter SPAR, both disabled 230 miles east-southeast of Kodiak, Alaska. 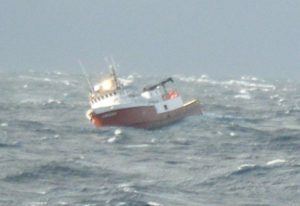 Fortunately, the four fishermen off the 87’ LADY GUDNY were airlifted by a Coast Guard helicopter crew and safely flown to Kodiak. What happened? 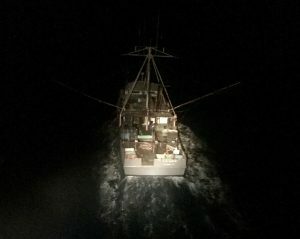 At 1:43 a.m. the Kodiak Coast Guard received a distress call from the F/V LADY GUDNY requesting fuel filters because the engine had failed and they were adrift. At 7:30 am, they called again to say they could not restart the engine. Weather was reported as 20-22 foot seas with 49 mph winds – see the photo above. The helicopter crew flew out and airlifted the fishermen off the boat, and the 225’ Coast Guard Cutter SPAR arrived to tow the LADY GUDNY to Kodiak. Unfortunately, the towline parted and tangled in the SPAR’s propeller, disabling the SPAR. Lines tangled in propellers are a nightmare for any vessel size. The commercial tugs ANNA-T and CHAHUNTA ended up towing the SPAR AND LADY GUDNY to Kodiak. On December 31st at 3:05 p.m. the Coast Guard Sector Puget Sound received a distress call from a mariner aboard a 27-foot crab boat that was disabled and adrift in the shoals of Bellingham Bay. 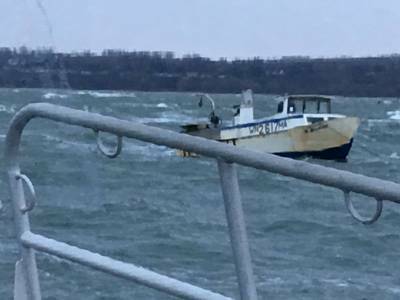 The mariner was safely removed from his vessel by the crew aboard a 45-foot Response Boat-Medium at 4:13 p.m. The mariner was listed in good health and did not require medical attention. When the mariner called for help, he was disoriented and unable to give his exact location to Coast Guard personnel. Thankfully, his location was established using the GPS signal from his cell phone. 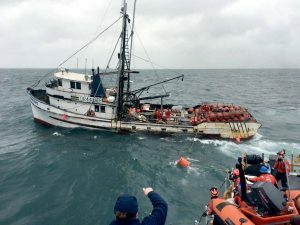 The U.S. Coast Guard began a two-week public Formal Marine Investigation today to determine the cause of the sinking of the 220-foot fishing vessel, ALASKA JURIS. 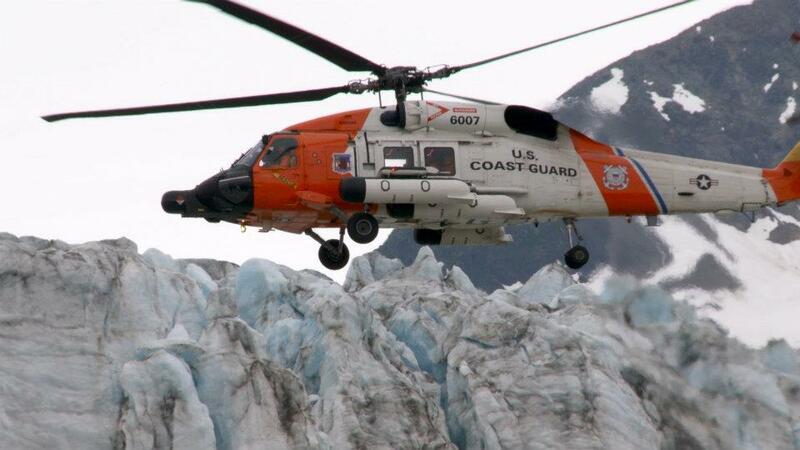 The vessel sank off Alaska’s Aleutian Islands on July 26th. 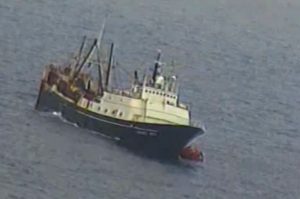 Efforts were made to locate the sunken vessel by the Coast Guard, Alaska Department of Environmental Conservation, and The Fishing Company of Alaska, but the vessel was never found. The ALASKA JURIS sank in approximately 5,400 feet of water, and its last known location was about 41 miles northeast of Segula Island. The Seventeenth Coast Guard District commander will be holding the two weeks of hearings at the Henry Jackson Federal Building in Seattle. Testimony will be streamed live and can be seen at Livestream.